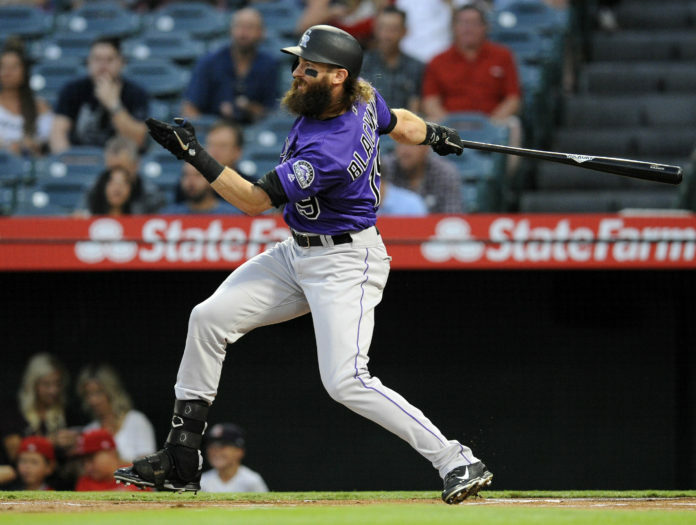 The Colorado Rockies defeated the Arizona Diamondbacks in convincing fashion Monday night at Coors Field, 13-2. The win bumped the Rockies record to 79-64 on the season. Arizona jumped out to a quick lead in the first inning which started with a triple off the bat of AJ Pollock. Eduardo Escobar then hit an RBI single to right field, putting the Diamondbacks on top 1-0. Outside of the first inning, Rockies’ starting pitcher German Marquez buckled down on the mound and was able to help pitch Colorado to victory. The Rockies managed to tie the game and take a lead in the bottom of the fifth inning, which began with a double from Ian Desmond. Catcher Tony Wolters then drove Desmond home with an RBI single to center field to tie the game at a run apiece. Marquez then reached base on a bunt which followed with a walk issued to Charlie Blackmon. DJ LeMahieu was then walked which forced home another Rockies’ run to give Colorado a 2-0 lead. Nolan Arenado later grounded into a fielder’s choice to score an additional run. The Rockies then were able to separate themselves from Arizona when Trevor Story hit a three-run home run, making the score 6-1. The Diamondbacks scored a lone run in the sixth inning but were unable to muster up any offense past that point. The Rockies added a few exclamation points in the eighth inning of their victory, which included scoring seven runs on eight hits. The inning started with back-to-back hits from Blackmon and LeMahieu which followed with an intentional walk being issued to Arenado. From there, David Dahl proceeded to blast a grand slam, making the score 10-2. Colorado’s offense did not stop there as Gerardo Parra and Desmond later hit singles to set the Rockies’ up with another prime scoring opportunity. Wolters came up in the clutch again, hitting an RBI single to center field. 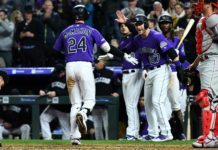 The Rockies added an additional two run in the inning via a sacrifice fly from Blackmon and a RBI single off the bat of LeMahieu, extending Colorado’s lead to 13-2. The Rockies dominated the Diamondbacks in all facets of the game, tallying 17 hits while keeping Arizona’s offense in check for a majority of the evening. Marquez went on to hurl seven strong innings, allowing one run on six hits while striking out 11 batters. The Los Angeles Dodgers fell to the Cincinnati Reds Monday. With the win by Colorado, the Rockies lead in the National League West was bumped back up to 1.5 games. The Rockies and Diamondbacks will continue their series Tuesday night at Coors Field with first pitch set for 6:40 MST.